Back in February, when we launched Raspberry Pi 2, the sharp-eyed among you will have noticed the folks at Microsoft making an announcement about bringing Windows 10 for IoT to the Raspberry Pi. We’re excited to share that it landed today – along with a ridiculously cool demo. The chap in the video is HoloLens designer Alex Kipman. I’m guessing that this video will leave a lot of you wanting to get your hands on a version of Windows 10 for IoT (called Windows 10 IoT Core) that you can use with your own Pi 2. This is all in Insider Preview mode still, so it comes with all the usual stability warnings. Microsoft has made the instructions on how to download the Windows 10 IoT Core Insider Preview and install it on your Pi 2 in one nice, tidy HTML page here. (I know a couple of our forum mods did so overnight because I got excited messages about robots from them which I found when I woke up this morning). The page is on GitHub, so you can issue pull requests. And yes, you will also need to have a copy of Windows 10 on your PC. You can get that by signing up to the Windows 10 Insider Program. We’re embracing the simple principle of helping Makers and device builders do more by bringing our world-class development tools, the power of the Universal Windows Platform, direct access to hardware capabilities, and the ability to remotely debug, update, and manage the software running on Raspberry Pi 2 devices. This Insider Preview release of Windows 10 IoT Core is our conversation-starter. Our goal is to give Makers the opportunity to play with the software bits early and to listen to the feedback on what’s working well and what we can do better. You may notice some missing drivers or rough edges; we look forward to receiving your feedback to help us prioritize our development work. We’ll be incorporating the feedback we receive into regular software updates along with additional drivers, bug fixes and new features. Those looking for a commercial-quality release should wait for general availability this summer. Matt Richardson, who is at the Build conference (hanging out with that little robot: B2 is spending the next day living on the Raspberry Pi stand with Matt, and we fully expect Matt to have trained him to make tea by the time the conference is ready to wrap up), and who was able to have a bit of a play with the setup while we in the UK were all fast asleep, seems impressed. We’ll be watching to see what the community does with Windows 10 for IoT on the Pi with great interest. Does the Raspberry camera work under Win10? Can we write c#+xaml apps? Can we remotely debug them? And is there hardware acceleration for GPU? This is an early beta, so there are lots of libraries which aren’t incorporated yet; I think we may have some MS devs popping in here later to answer questions, so I hope they can help out! I wouldn’t be too surprised if Win10 for IoT would support the kinect for a raspberry – at least, i think it’s arguable to hope. The Kinect wouldn’t be integrated with the GPU though, unless MS and the Foundation hardware engineers create a Camera Serial Interface for the Kinect, and I don’t ever “see” that happening. The Pi USB bus is too slow to handle Kinect video from its camera, let alone the depth sensor and multi-array microphone data. The Kinect needs an Xbox 360 or Xbox One and that’s an order of magnitude higher capability on the CPU side than even the Pi 2’s quad-core, 900 MHz SoC, and that’s not even taking into account their GPUs, which are more powerful than the Pi 2’s. I’m not interested in video, just the ability to get depth data images/snapshots from the XB1 Kinect. Clearly, the Pi can handle this, no? Just beginning to look into it. Never played w/ the XB1 Kinect at all, yet. The Pi isn’t anywhere near powerful to handle a Kinect. It’s just not feasable. That’s not true. I’ve run librekinect on Raspbian on my Pi2B. You can’t imagine how long I’ve been waiting for something like this to happen. My mind is going wild with ideas I have for my Apps running on Raspberry Pi’s. The educational and scientific applications of the HoloLens seem almost unlimited. The Pi changed the way I thought about computers. The HoloLens is doing the same, in a different way. And they can work together! Escape from ‘the tyranny of the screen’. I am sure there will be limitations and hard grind. All the same: it feels like the future is here. I am *very* excited about the HoloLens. Obviously, this is a demo performed in a very controlled environment, but to me this looks an awful lot like the future. We didn’t know we were going to see the Pi working with it until quite late on last night; much punching of the air was being done in Cambridge. HoloLens is very neat and I do hope it develops into a fully fledged consumer and business product. For me, we have “arrived” in the future when I get holograms without smoke and mirrors, electronic white boards and hoverboards. So, only the hoverboards to go now. Hmm….Hololens + Pi2 + MinecraftPiCode + Robots anyone? I want a raspberry pi 2 and Hololens now. I can’t wait anymore. Any SPI or GPIO support yet? This is a mourning day for me. Raspberry Pi and the Raspberry Pi Foundation was for me one of the best engine to promote Open Source and Linux systems. But that was yesterday. Nothing’s changed there. The thing about open platforms is that they’re open for *anybody* to develop on them. Of course, our standard distro is still Raspbian, which is built on Debian. I think Microsoft sees the Raspberry Pi with great potential for future development and wanted to bet on the winning horse. And Microsoft is now embracing open source. Don’t see this as ‘Microsoft is taking over, open source is dead’ see it the other way, open source is taking over, Microsoft is changing. Christopher, are you saying Windows 10 IoT is open source? I don’t see that statement made anywhere. It made me smile when I saw “This is pre-release software, so it comes with all the usual stability warnings”, I know the MS story and it is really telling you that you should expect stability issues with the final release. ughhh… ill have to update my win 10 dev preview !!! So it is running on the RPi like a RDP Client ?. Maybe they will enable a WiFi Adaptor, so can be untethered from the Ethernet Cable ? GUI app support is still a work in progress. You can run simple GUI apps, but optimized video drivers are incomplete in this build. It is coming though. Currently, you can draw simple items on the screen, and also run “headless” apps. Those headless apps will run some kind of functionality without a display. They will operate like a service, but with foreground priority. There are some web server examples on the page to check out to give you a rough idea of what I’m talking about. They can be fully automated, or require remote interaction through a web service, PowerShell, or other remote GUI. Speaking of PowerShell, this is the way that you can connect to a remote text terminal on a Windows 10 IoT device, much like SSH on Linux. PowerShell is something every budding coder should learn on Windows systems. It isn’t your grandfather’s DOS, that’s for sure! Why not use ssh to connect rather than PowerShell? It’s a proven, secure open source method of remote connection. Take a look at the new SSH article. That’s why you shouldn’t use SSH – especially over an Internet connection. Just try it some time and watch how fast it takes for someone to ping your ssh port and start doing dictionary attacks against you. I guess the idea for not providing SSL for PSSession and Web access out-of-the box is to push you to install a trusted certificate, but IMHO it would have been safer to disable those services by default, or use a Self-Signed cert. This looks exciting. I am constantly amazed at what can be done on the Pi. I might finally install a copy of windows in boot camp on my Mac. Never thought I would have reason to. …it will have to be Windows 10 of course. Yes, and the installations, O.M.G! Is this really a hologram, or do you need to look through a device to see this all happening, and it’s really simply just a piece of augmented reality? If it’s just AR, why do they call it a hologram when it isn’t? Do they know what a hologram is? You can see that the lady is wearing special glasses and also on other videos, the camera filming it is also specialized. So, can’t be seen with the naked eye. I would like to run Windows 10 on my Pi but this looks complicated. Will the Raspberry Pi get the final release of Windows 10? or will it always be just for developers? When Windows 10 IoT is installed, the Raspberry Pi 2 becomes a device which can run Windows 10 Universal APps (UAP). The app can show a UI, if the Raspberry Pi is not running “headless”, use GPIO / other input devices (USB Keyboard, mouse etc) and use the network. The details on how you can use the Windows app store to download apps is unclear to me, but currently you can develop applications for your Raspberry Pi 2 with a normal PC where Windows 10 and Visual Studio 2015 RC is installed. You can deploy the app to the RPI2 and even use remote debugging. So… it runs one APP and has an UI (with icons, mouse etc) but from the app, not the Windows UI where you can start applications. Sounds like the perfect device for a Home-Automation APP which shows an UI AND controls the hardware at the same time. The Windows Store will not likely be available on the Pi, but the development story and packaging format for UAP, which is what the Windows Store uses (but will also include AppV-deployed desktop apps in Windows 10), will be the same for the Pi. The cool thing is, a developer can write code toward the Universal App Platform, target ARM (including the RPi2), and simultaneously target x86 on PC’s and offer their app on the Windows Store – but ONLY IF THEY SO CHOOSE. If this were a developer in a company, they could choose to take their Universal App and deploy internally and not push their app to the Windows Store. They could, for instance, write their app, and build an x86 version that they could deploy to a virtual machine for testing before deploying to real ARM hardware (although features like additional hardware busses will be missing in the VM). The choice is theirs. This is just an extension of what was already available in Windows 8 where a developer could write a WinRT app, and just check a box for ARM support, and do a side-load on corporate systems instead of publishing to the public Windows Store. I don’t understand why they didn’t create a GUI for it. Ok, all I saw was a pretty run-of-the-mill robot drive around on a stage. I find it a bit dishonest to make that look somehow new with a cartoon overlay. How much of this demo actually ran on a Pi? 5%? If Windows 10 is the future of Raspberry Pi, then I’ve probably bought my last Raspberry Pi. At best, now there will be cool looking projects that their creators did very little work to create, making the real projects that people put a lot of work into look shabby. Microsoft courupts everything it touches. And you seen to have fallen in to the trap of assumption. Why are you thinking that Win10 is the future of Pi? No-one has EVER said that. Raspbian continues to be the Pi recommended OS, and will continue to be pushed for education. This Win10 IoT OS is simply another option for the end user. It’s not replacing anything. MS have simply chosen to port their stuff to the Raspberry Pi. You really really don’t have top use it if you don’t want to. And clearly, MS do NOT corrupt everything they touch. I’d like to see what’s happening at the camera during the presentation. Does it have a hololens monocle stuck in front of it or is the composite image assembled later using some powerful gaming computer? There is a scene where you can see the cameraman, and his camera, which is a contraption with a hololens mounted before the camera, so what you see is what you would see if you where wearing a hololense. The virtual reality is interactive, and thus rendered in real time. I noticed while I watched the keynote stream yesterday that the camera being used on stage was definitely modified in some way. It was tethered with a fairly large cable backstage and had a bunch of electronics that had been added to the outside. Now, that’s not to say for sure that it wasn’t all being composited backstage but it sure looked like the camera was looking through the Hololens hardware. They could fake it, but there were a lot of people actually in attendance that should be asking those questions (as tech reporters). I think it is very likely the images are composited separately as a video overlay. You can see the “colour wheel” in the demo screenshot is completely opaque, which is very hard to do when using “optical-see through” AR (where the real world is observed directly), which definitely seems to be the case with HoloLens. Transparent wave-guides that can be seen through but also allow essentially reflecting a virtual image plane some distance in front of the eyes are possible, but that will give you additive blending – a white pixel on the reflected display will make the bit of the world brighter, but there is no way to darken the view at that particular point. Controllable opacity across the field of view is not a simple problem at all – you can’t just stick an LCD panel there as the pixels will be out of focus. You’d need a panel that could dynamically vary its opacity based on both 2D position across the panel but also based on the ray angle to be able to display opaque virtual objects with sharp occlusion boundaries. What I think the HoloLens does instead is has a separately controllable layer that can simply be globally darkened (I have read in write-ups there is a global “hologram contrast” setting which I suspect maps to the darkness of this panel). That would still be additive blending (impossible to show a black object on a white background) and the images above are definitely not additively blended. So either a) MS have cracked the controllable opacity aspect or b) The press images / “live” videos are misleading. I think (b) is more likely – if controllable opacity was solved there would definitely be certain elements of these scenes that would work better if they were 100% opaque, and reports I’ve read always mention that the content is always semi-transparent. It annoys me a lot that none of the tech press ask the right questions around this stuff, and I would definitely like to see a video shot directly through the display with less smoke and mirrors! Microsoft is clearly not “bringing Windows 10 for IoT to the Raspberry Pi”. They’re using the Raspberry Pi to add GPIO’s to a regular Windows 10 PC, and for that they need software to run on the Pi as a client to the PC. That’s all fine of course, anyone can use the Pi for whatever they want, but stating that they’re ‘bringing Windows 10 to the Pi’ as if they’re doing existing Raspberry Pi users a favour is really stretching it. It adds nothing to the Pi ecosystem, it adds to the Windows 10 ecosystem. Be excited if you have a Windows 10 PC and want to use the Pi as an extension to that. If you already have a Pi running Raspbian, there’s nothing to be excited about. That’s a pretty glib outlook for someone that might want to code using techniques they used in Visual Studio and want to bring that over to IoT platforms and are attracted by the Pi’s potential as a target hardware platform. For that specific Visual Studio using someone the Raspberry Pi does indeed make a nice extension to the Windows 10 ecosystem as a target platform. I’m not disputing that. Microsoft is bringing Raspberry Pi to the Windows 10 ecosystem. It’s fine. Before making comments you should read the information available. Win10IoT on Raspi is an embedded OS, with or without display. Once you create your code it no longer requires a PC or any other connection (unless that is how your app works). Where the Raspi foundation has failed in its approach is in not understanding that before people can code, they need to learn how to read and comprehend. Many of the uneducated comments on this thread are an example of that failure. My comment was well informed. Maybe you should read it again to comprehend it fully, and not make assumptions and generalizations. Your personal preferences mean nothing to me. And stating “*nix is missing professional quality tools and real documentation” is just silly. The RasPi foundation understands perfectly what education is all about in 2015. There have been new developments in the way we look at education since you were in school. Things change fast so it’s never perfect, but it’s not failing. I fail to see this point. Simply by “adding to the windows 10 ecosystem” you in turn add it to the raspberry pi ecosystem. These statements are fueled by anger with a brand. Which is fine. However they are not logical. Which is linked to from http://ms-iot.github.io/content/Downloads.htm which says that page is the one to get Raspi 2 stuff from. I’ve figured it out. They have a really daft UI. I’ve already signed up to the IoT programme. The first page I linked to comes up blank because there is a dropdown at the top right that you need to select “all available products” (or similar) from, then choose the IoT preview from the list and click “join”. You then have 2 EULAs to accept, then finally it will give you the option of downloading the preview image for Pi 2. What a carry on. Dude. You need to accept the EULAs, didn’t you read the guides they have? It clearly states that if you don’t open the EULA page and accept it the download page will be blank. Anyways it looks like it’s not gonna be what so many people thought – a full Windows computer for $35, but instead yet another platform to hack GPIO with. 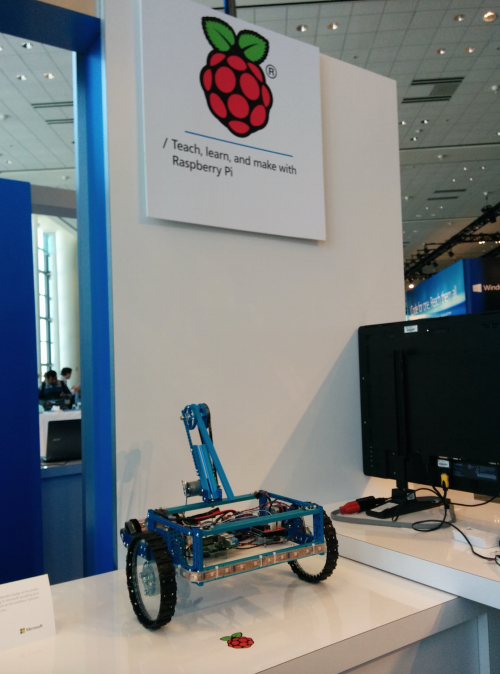 but here is the big question… will the robot work on raspbian!? 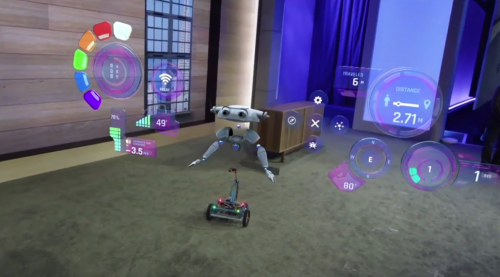 It’s a fine demo and all that, the hololens is obviously an impressive piece of hardware, the robot is lovely. This doesn’t mean that Windows really be used on the Pi – the Windows 10 IoT preview is essentially a bolt-on piece which can only be used in concert (at least for development) with other devices, at least one of which is a Windows PC. Which is fine, if that’s what you want it to do. So you can use a $35 pi as a glorified add-on to a $1k PC running Windows 10, it’s all lovely. But it isn’t really very core to what Pi originally intended, as self-hosting system where people could actually write code. It seems that it is probably impossible to do any coding on Windows 10 IoT on a Pi. Makers *CAN* presumably develop standalone “apps” (which seems to be the current term) to run on the Pi on Windows 10, much as we can for (e.g. ) Arduino, but they can’t develop *ON* the Pi. Or did I misunderstand it? Yes, and no. Don’t forget that compiling code on a Pi is horribly slow, and cross-arch development is still a big frustration. For complicated projects, you’re just better off with a PC. And don’t forget that you already need a PC just to load your OS image onto your SD cards to boot a Pi. If you really wanted to, you could always code your own development platform for the Pi as others have done. Windows 10 for IoT is targeted squarely at existing Windows debs who want to enter the Maker space, and it does an outstanding job of satisfying that goal. It really does run Universal Windows Platform apps, albeit with reduced services. Although it only supports on foreground app, it is a multithreaded, multitasking kernel that will support plenty of background tasks. It also brings a ton of Windows services such as Alljoyn, standard windows hardware drivers, and incredibly simple connectivity. Microsoft stated very clearly that they don’t think people should rush out and switch to Windows on Pi for all their projects, rather they want it to be one more tool in the toolbox and empower users to pick the best tool for the job. Sometimes that means Windows 10 IoT. It is aimed at anyone (private and company) that wants to create an embedded/standalone product with excellent hardware. The combo of Win10IoT and Raspi is a great value proposition. Headed or headless there are a lot of opportunities to build product with this combination. This release goes far, far beyond just Makers. Do you think that the IoT Core has the potential of getting any sort of desktop-like interface? Also, does the IoT core come with windows for ARM apps like silverlight? Can you use the OS to potentially use windows programs? For anyone having difficulty with no downloads showing go to the site below, click on the connect link and accept both agreements, the downloads become available after that. I can’t believe the amount negativity already on this thread. If you don’t like it, don’t use it. Why do people feel the need to bad mouth MS at every opportunity. If you don’t want to run Windows 10 on your PC, I doubt your going to want to run Windows IoT on your Pi. Stick to Linux. Skip past the post and get on with your life…..
We really should stop knocking Microsoft. They have made huge mistakes in the past, but I think they are really making an effort to reach out to users now. With the Windows 10 Technical Preview, Visual Studio 2013 Free, and now Windows 10 IoT for the Raspberry Pi. Whatever we think of Microsoft, 95% of the Colleges I go into as a consultant use Microsoft for desktop, development and applications. They use LAMP for things like Moodle, Intranet and Internet. Its all about using what is best (regardless of if it is closed or open source). If Schools and Colleges used Libre Office for example then they would not be work ready when the majority of offices use Microsoft. I want to have continuity in my work. Developers of closed source software can suddenly become redundant or forced to quit for other reasons, and then they cannot continue to build on the code. If you develop closed source software privately and then take a job, then the new employer can claim that they own the code developed earlier because you used it to solve problems for them. In that case, it’s good to be able to point out that the code was openly published e.g. 20 years ago. Best is to always develop open source unless you are so rich that you will never need to be employed. Imagine a journalist who just wrote articles he could not read for himself after he changed jobs — unreasonable, but it works like this for programmers in closed-source. It happens that companies simply erase valuable code many years after you left instead of publishing it as open source. Furthermore, there are of course the other reasons for open source Stallman usually gives. You should develop your skills. That trumps technology bias anyday. Developing skills is good, but it’s better to also have access to the code you wrote. Developers of Open Source can often stop developing, then no-one else takes it on. But that probably only happens if few people are using it. If many are using it they could hire an open source developer. Microsoft has developed some amazing hardware – HoloLens – and the initial software to run it will be whatever Microsoft provides. If there’s a demand for an Open Source alternative, if people are sufficiently motivated to make one, I’m sure it will emerge. Could someone please post a screen shot of the Desktop OS running on a Pi? And, does the new IOT version of Windows include a Web Browser? If possible – please post a screen shot of that too. ‘Merica – F Yeah !!!! err NO it is not a standard end user OS. W10 IoT is to encourage developers to develop using Microsoft Tools. No, its not the desktop version. This is not Windows 10 like you would have on a PC. I’ve been following the instructions on https://ms-iot.github.io/content/win10/SetupRPI.htm to get my Pi version 2 to run windows 10 IOT. configured the SD card several times and all the files appear on the SD card but the PI won’t boot from it. Anyone got any ideas about the boot files it is looking for? Mine took a REAL long time to boot. I’m using a class 4 microSD card. As long as you’re getting the ‘operation completed successfully’ message after dism, you should be good? I don’t have a computer with windows 10 on it but I can’t wait to get one of these kits and stuff!!!!!!! You don’t actually need a PC with Windows 10 on it. What yuo need is the proper version of DISM which is also in the Windows 10 ADK Technical Preview https://go.microsoft.com/fwlink/p/?LinkId=526740 . That one you can install even on Windows 7 machines. I did that and was able to flash the SD card. Would this IoT thing support USB devices with special drivers, like RTL SDR, so I can plug my usb dongle and make some apps with radio signals processing? 1. Are you planning to release Raspberry Pi Compute Module Pi2 type (with 1 GB Memory and 4 core ARM)? 2. If yes, it will be running also the WIN10? 3. If yes, will you keep the pin out same with the former one? Does Windows 10 IoT and Netboard have the same relationship with Raspbian and Arduino? Is it posible to obtain a copy of windows IOT without joining the program? No, you need to join the programme. Its free but you just have to accept the T&Cs. Guys, any company that decides to port anything to the pi should be applauded, be it Microsoft, ibm(os/2 anybody? ), Linux foundation. If you don’t like windows, or Linux, or whatever, then don’t use it. Kudos to the foundation for making the pi available to everyone! please GNU/Linux. please Free/Libre Software. Yes, that is all available, and always has been and always will be. There is no law or rule that says you have to use Win10! Marketing, marketing… As already said, windows 10 for rpi is just a remote GPIO API to windows. They could have done the same with linux if they were really multi platforms an open minded (probably with stability as a bonus). But their new marketing strategy is just to make people forget that they were never part of any of the last revolutions (iot, docker, arduino, raspberry, cloud, mobile) and that they are way behind in every domain. Now they put a maximum amount of money in demo of tech previews and try make you think you can stop being a geek by using their products. Open source your solutions, advance in the same direction than the community that created the success of thoses products without trying every time to put MS name up front like you invented everything and I will take you seriously. This is not simply a GPIO add-on for desktop windows. The Pi can run standalone once the code is installed. As for the other comments? Well, try reading some of the comments above. You do know .Net is going entirely open source, right? I want a raspberry pi 2 badly now. Can’t wait til Christmas. I love what Microsoft is doing with this initiative. They realize the value of an open platform like the Pi, and seem to be embracing it. I can imagine, maybe in a year or two, all of the creative projects that developers will be making with Windows 10 IoT. I’m excited to watch and experience the creativity of more “Windows-centric” developers in the Raspberry Pi community too. Maybe some of us “*nix-centric” folks will be willing to broaden our horizons and learning something new! Hmmm some of my comments have disappeared. Can we use C++ rather than C# as the implementation language? So I’m looking for a computing platform to build distributed services on, and it now becomes a question of which platform is “better” for that on a RPi2 cluster and which one launches first. So far the candidates are Windows 10 IoT and Snappy Ubuntu Core. It’s amazing the negative reaction some are having about this. As said before: If you don’t like it, don’t use it.I love visual studio and was very happy that Microsoft provided a way to allow me to create IoT devices with my Pi and .Net. It’s not for everyone, that’s true. But to give it the *thumbs down* just because it’s Microsoft? Microsoft is giving away free development tools and OS support for the raspberry pi…as well as giving away a free upgrade to Windows 10. Not really sure where the downside is here. Currently how many Pi’s are out in the world ? I bet there is are quite a few now. (I can reach 4 from my chair ;) ). This means there are a lot of people experiencing Linux for the first time, and in a practical way, not just launching a browser or media player. Lots of people realising there are other OS’s out there and that they can be useful. Is the release of ‘Win10 IOT’ Microsoft making sure they are not absent from role call. Making sure there is an MS option. No need to try one of these strange OS’s you have never heard of. You can still stick to good old Windows. If any bods from MS do read this, Open Source Win xp and get it running on a pi. I’d love to see that. XP in your pocket. It’s a real pity that Windows 10 IoT Core will not have a Desktop and not even a shell. That is a serious step back from Raspbian + Mono. Some good news: ASP.NET 5 will be coming to Raspberry Pi 2 + Windows IoT Core. It is currently being worked on. As I see there are experts in here about this great device, I have started to make some of the samples and works like a charm, but then trying to use GPIO.PWM does not exist, and I was not able to do by code. And the same happened with trying to read change values with a capacitor to read thermistor values. Does any began to develop for Pi2?. And how much will the final version of this Windows 10 IoT cost per user/per Pi once it’s officially released? Great start but I will have to wait till you can get a BLE stack before I can do my project. Will WCF (Windows Communication Foundation) run on windows 10 for IoT ? Or maybe a NETMF framework is better with ghielectronics boards ? Why is IT suddenly so complicated to put a system on a SD?? Fot raspberry there are so many exampels of easy system boot’s, but here you nead a lot of Tools and other systems to get IT to work. did anyone using raspberry pi 2 with WIN10 loT and running vb.net language program?? This is very exciting. For people who have not done any development in Visual Studio you may not realize for a lot of people this is an extremely productive way of bring your ideas to reality. It has always been the glue that enabled developers to productivly work using different technologies. It’s debugging and intellisence tools have always been huge assets. What is also important here to realize what .net 5.0 will be all about. It is very granular. You will be able to deploy the parts of the framework you need to. You will now be able to develop apps that will work on almost any hardware configuration and minimize greatly using resources for parts of the framework that were not being used. This is not about the desktop. This is about the newest buzz word IoT (Internet of Things). Yes I think the term is still being defined and yes like always there are people who have stretched the use of that term for their gains, but it is about having a lot of different computerus and controllers doing all sorts of tasks and all working together. From what I’ve read so far I see that Microsoft isn’t allowing Windows 10 as we see on a PC, just a cut-down version called IoT. So as for running Windows 10 desktop (I’ll call it Win10 r/t) al la my Surface 2 I guess the answer is NO! I think this is a shame because I have no need for IoT but would find Win10 r/t extremely usefull, especially as I have purchased a Pi-Top which is soon to be officially released. Microsoft definitely missed out this time. Here’s hoping they change their mind. Will it be avaialbe for the first pi, or am i being over-amitious? I’d love to see if it could work on it and what i could do with that, but i suspect it’s underpowered for the job. It’s only been developed for Pi2. can i connect and normal HP or cannon USB printer to an Raspberry PI device with Win 10 core flashed in it. Any suggestions.? Odd thing for me, Raspberry Pi 2… can load Debian Wheezy 5/2015 release find, run it fine. But not Windows IoT. Pi2 just boots to IoT start up screen and goes into an endless loop, seen a lot of other Google threads that state the same thing. Any ideas? The Windows 10 IOT is designed to used on the lower power Raspberry Pi 2, but you are able to implement XAML/C#, and I have written a blog titled: Windows 10 IOT: Windows Forms to XAML/C# & Webservices (use Bing or Google to search for it) on the process to use Windows 10. I have an honest question. Being that the Raspberry Pi 2 B has all the minimum hardware requirements covered and if I have a 32Gb SD card in it, Would I be able to run a Full version of Windows XP 32-bit on it? I’m just curious because if I could, then I could use one of these Raspberry Pi 2 B’s as a slightly better featured Windows XP Retro Gaming PC for my games like Starsiege and Sacred that are not compatible to run on my Windows 7 main computer. Plus that, it would be pretty cool to have a little Pi 2 B that runs a full windows xp that I can carry around in my pocket and hook into any hdmi compatible tv’s or monitors in my area. Since the Pi 2 B covers the minimum requirements – I’m assuming it could theoretically run a full version of Windows XP or no? Sorry, no. Check the forums. The best thing is that you’ll be able to get proper Minecraft on your Raspberry Pi, just get another SD card and install Minecraft on it! MagPi issue 33 – out now!